The latest Avengers: Endgame TV spot offers some new footage of Carol Danvers and Rocket Raccoon. Even with the highly anticipated movie only weeks away now, Marvel Cinematic Universe fans still really have no idea what to expect. The Russo Brothers and Marvel Studios have been teasing little bits of footage out at a time and we're not even confident that all of it will be featured in the final cut of the movie. The Russos have admitted to using dummy footage in order to keep everything under wraps. 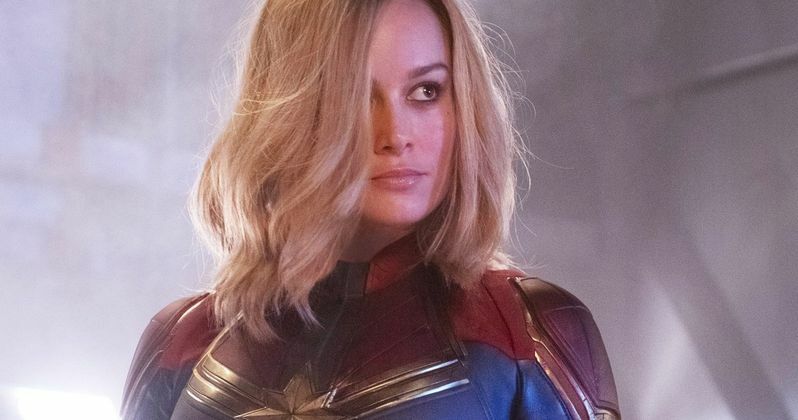 MCU fans were recently treated to our first look at Brie Larson's Captain Marvel with her stand-alone adventure. The movie, which just crossed the $1 billion mark at the box office, featured the immense power of the character and now it's being teased in the latest Avengers: Endgame TV spot as she is briefly spotted going into Binary Form. While were unsure of the context, we know it isn't a good idea to be on the receiving side of her intense powers. Elsewhere, Rocket Raccoon is piloting the Benatar with Earth's Mightiest Heroes on board and asks if anybody hasn't been to space before. After nearly all the hands go up, Rocket warns that nobody better "throw up" in his ship. There's a quick edit to Hawkeye laughing, but it's not clear if it's from the same scene. Thor and Carol Danvers were the only ones not to raise their hands when asked about previous space travel and Rocket definitely knows his way around the galaxy in his ship, which he is technically the sole captain of once more. Avengers: Endgame hits theaters on April 26th, which is just a few weeks from now. MCU fans are about to get to see how Phase 3 will end and how Phase 4 will be ushered in. We've been spoiled with the recent releases of MCU movies, which is looking like it may slow down a bit after Spider-Man: Far From Home this summer. With that being said, the Russo Brothers and Marvel Studios have a lot of pressure a satisfying ending to eleven years-worth of storytelling. It's not going to be an easy task in the slightest, but they all seem confident in what they have achieved. You can check out the latest Avengers: Endgame TV spot below, thanks to Marvel Studios.